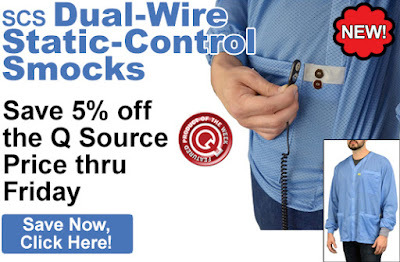 Save an extra 5% off the Q Source price of SCS’ NEW Dual-Wire Static-Control Smocks. Get this special discount by adding an eligible smock to your shopping cart. Our Featured Product promo is valid Monday, January 29, 2018, through Friday, February 2, 2018. These NEW groundable static-control garment systems from SCS offer hands-free hip-to-cuff grounding and are compatible with dual-wire continuous monitors such as the SCS 724 Workstation Monitor. These smocks meet ANSI/ESD S20.20 requirements and are available in sizes XS to 6XL available. Follow our Free Freight and Featured Product selections at our Q Source Resource Blog, by subscribing to our email newsletter, or on our social media accounts. We’d appreciate if you could help us spread the word about these great money-saving opportunities by sharing these offers with your friends and colleagues. Click here to purchase these NEW SCS Dual-Wire Static-Control Smocks. For further questions, call us (800-966-6020), or send us an email. Please note: This promo is valid only at QSource.com. 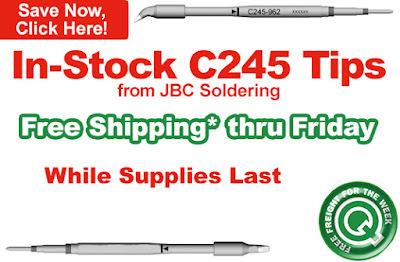 Get Free Standard Shipping* on in-stock JBC C245 Soldering Tips. To take advantage of this discount, just add an eligible tip to your shopping cart. Our Free Freight promo is valid Monday, January 22, 2018, through Friday, January 26, 2018. * Free standard shipping in the contiguous United States. Eligible tips are available in a number of cartridge sizes and types with various tip shapes including Conical, chisel, blade, spade, and minispoon tip shapes. They are for use with the JBC T245 and T245-A Handpieces. Click here to purchase a JBC C245 Soldering Tip. For further questions, call us (800-966-6020), or send us an email. Please note: This promo is valid only at QSource.com. Get Free Ground Shipping* on these Resistance Ranger Constant Monitors from Transforming Technologies. To take advantage of this discount, just add an eligible monitor to your shopping cart. Our Free Freight promo is valid Monday, January 15, 2018, through Friday, January 19, 2018. * Free standard shipping in the contiguous United States. CM1601 RangerOne: This model is the simplest and most cost-effective constant monitor. It monitors the resistance of 1 person/wrist strap. It also provides a second unmonitored ground jack. CM1602 RangerTwo: This model monitors the resistance level of 1 person/wrist strap and the worksurface. It also provides a second unmonitored ground jack. CM1600 RangerPro: The RangerPro measures the electrical resistance of two wrist bands, two work surfaces, and two auxiliary grounds simultaneously. It also provides a two additional unmonitored ground jacks. 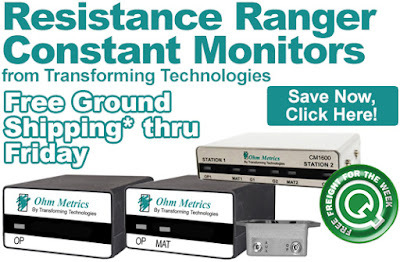 Click here to purchase a Transforming Technologies Resistance Ranger Constant Monitor. For further questions, call us (800-966-6020), or send us an email. Please note: This promo is valid only at QSource.com. Static Solutions’ Q Source Resource Guest Blog offers a solution to the electrostatic discharge that is common (and potentially dangerous) this time of year. Plus, learn about a related special offer. As the seasons change from warm to cold, so too can the risk of static. Typically, as temperatures drop, dryer conditions increase because of reduced humidity. You may notice static shocks as you get out of your car and touch the metal of the vehicle or when you walk inside across a carpet and get a shock as you touch a doorknob. Each situation may be a slight annoyance, but if you need to be mindful of ESD (electrostatic discharge), the increased risk of a static can be costly, or at an extreme, deadly in potentially explosive environments. and helps your skin to not dry out, crack, or flake. 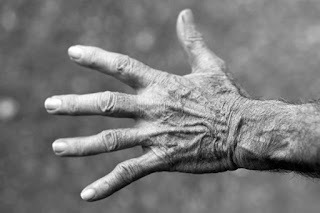 Following basic EOS/ESD standards of the 20.20 is a requirement for many companies, and taking steps like using proper personal grounding such as wrist straps, heel grounders, or hand lotion can be an important part of your plan. Yes, even hand lotion can help at this time of year! Applying moisture to your skin adds another layer of protection by increasing conductivity to your wrist strap. It has the added benefit of helping your skin to not dry out, crack, or flake. Currently, we have a special offer on our Clean Room ESD Hand Lotion at QSource.com. For a limited time, you can get FREE Shipping on a full case of lotion and get a dozen free pumps with your purchase. This makes it easy to place several bottles in specific areas around the workplace, so you and your team can be protected. For information about Static Solutions and their wide selection of ESD control products, please visit QSource.com. PLEASE NOTE: The ESD Hand Lotion promo is valid through February 28, 2018. You may also contact us via email or phone at 800-966-6020 and we will be happy to assist you. A big thank you to our friends at Static Solutions! We appreciate the information about ESD, hand lotion, and the money-saving special offer. 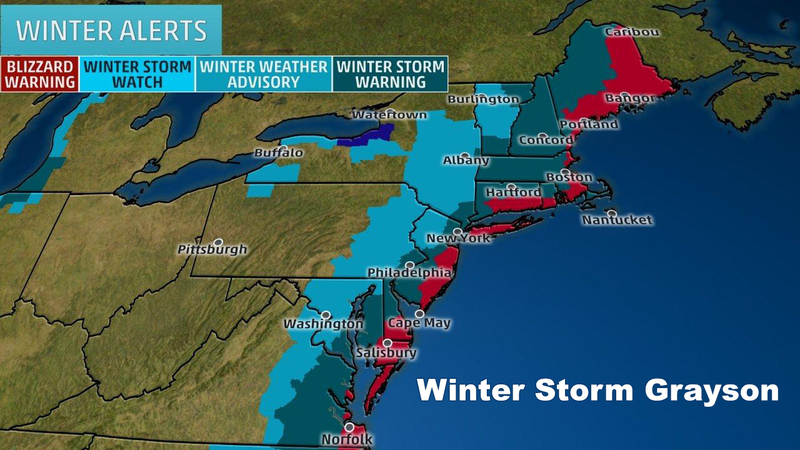 Q Source's New York office and warehouse will be closed today due to Winter Storm Grayson. There will be limited assistance available. Pending orders will be processed and/or shipped tomorrow. Please stay tuned to our blog and social media posts for further info. QSource.com is available 24/7 and you may contact us there or via email. Our phone answering system is also available at 800-966-6020. We expect to be open tomorrow, Friday January 5, 2018, for regular business hours. We apologize for any inconvenience. Thank you.